Plants.Regions devoid of plant life are among the most uninhabitable wastelands in the world. The rains or melting snows, unchecked by an absorbent mantle of forest or grassland, sweep over the bare slopes in torrents, carving out gullies that grow with the years until they become great barren valleys. Then, with the passing of each unchecked flood, the watercourses shrink to a trickle or vanish entirely. Without plants there can be no cool, clear trout streams; no shady camping spots; no fertile, humus-bearing soil; no food for other forms of life. Even in desert lands there is usually a thin mantle of plant cover which, though sparse, helps hold the soil in place and permits a foothold for higher forms of life. Recreational enjoyment of plants ranges from subconscious appreciation of their beauty and shade to active interest and wonderment at the marvelous diversity of plant forms which results from their adaptation to the earth's extremes of climate and environment. Unity of plants and animals.Plants and animals are dependent upon one another in a manner so complex and far reaching that they cannot be fully enjoyed, or protected, separately. As an example of this interdependence, in mountain regions acorns roll downhill when they fall from the trees. Therefore, in the course of centuries the forests would travel downward from the high country and eventually would disappear if their reproduction were not assisted by other members of the plant-animal community. 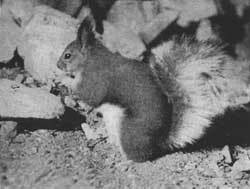 However, jays, woodpeckers, squirrels and other small animals that eat acorns assist the forest through their habit of carrying off and storing the surplus crop of nuts. 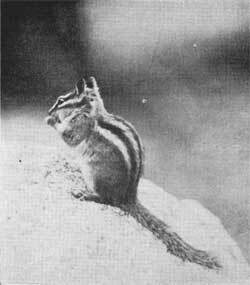 Figure 29.Chipmunk of the Transition Zone. A commonplace, though very important and often forgotten, example of plant-animal dependence is the plowing and cultivation of the soil by billions of insects, earthworms, field mice, pocket gophers, moles, and other small burrowing animals. The vegetable matter that they drag underground to line their nests, or to eat, is transformed into humus that is essential to plant growth. In addition, the loosening and turning over of the earth through burrow excavations permits air to enter, which is required by the humus-forming bacteria. It also allows water to penetrate the soil, which otherwise would settle and pack year by year until it became as impervious as sandstone. When water penetrates the earth instead of quickly running off the surface, there is far greater plant growth; the soil washes away but little or not at all; floods are fewer; the soil is more fertile; and the land is a better place for livingand for recreation. Animals.If plants are essential not only to other forms of life, but to most recreation, animals are hardly less so. At the beginning of the war only about 2 percent of the millions who went into the armed forces had previous experience with firearms. Their new skill and acquired habits of wide travel surely will further stimulate hunting, and no doubt fishing as well. Figure 30.The spreading ripple of a beaver. The trend may be still further accelerated if there should be a revolutionary increase in civilian aviation, permitting the average sportman to reach even the remote and choicest fishing and big game areas in a few hours. Fishing and hunting are only two of many recreational values of wildlife. Rivaling the sportsmen in enthusiasm is a rapidly increasing group of amateur and semiprofessional wildlife photographers. Though the hunter may have a lifetime of unforgettable experiences, the wildlife photographer can claim an even richer field of opportunity and golden memories. For him there is no closed season, and no animal, however rare, is on his forbidden list. With luck and patience he may "catch and hold," to enjoy forever, yet unharmed, many beautiful and vanishing creatures denied to the hunter, such as the trumpeter swan of the northern lakes or the stately bighorn of the crags and canyon walls. Probably even more important, though less vocal than these special groups of enthusiasts, are the millions of persons who derive lasting enjoyment from just watching and being near wildlife. 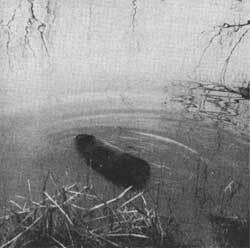 For them the splash and spreading ripple of a beaver on a twilit pond or the fairy-like chimes of a thrush in the cathedral stillness of a forest, are a source of inspiration complete in itself. Their enjoyment is not to be measured in dollars, any more than sunshine or freedom can be so measured.